What a beautiful looking floor. Travertine is so beautiful that vinyl composition tile manufacturers have and still make vinyl tile that looks like Travertine stone. I guess imitation is the best form of flattery. 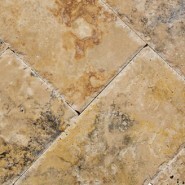 This article’s goal is to give our readers procedures of how to clean a travertine floor, a list of the best supplies to use to clean travertine floors and an explanation of what Travertine is and a new innovative cleaning pad that will provide superior results and making the cleaning of travertine floors simple and green while using less labor. Travertine is a special looking floor with many holes and channels running through it. Most of the time, the Travertine holes are dark in nature and this occurs naturally as part of the characteristics of the travertine stone itself. But many commercial building owners mistake these dark holes as soil that is trapped in the holes of the stone floor and want to clean them out. This is a mistake because it would not be feasible or for that matter practical to attempt to lighten the darkness of these natural occurring holes in the floor. The darken holes actually give this stone its character and makes it a stunning looking floor so any attempt to remove the darkness of the holes would be to take away from the beauty of the travertine floor.The following cleaning procedures are a guide line for commercial buildings but for the most part (without the power equipment) can be applied for cleaning Travertine floors in residences. If you know how to clean marble, granite and other quarried (mined) stone flooring, you basically know how to clean and maintain Travertine floors. It can be cleaned with water based cleaners. We do not recommend using a top coating floor finish or seal on travertine floors but it can be coated if the user absolutely wants to top coat the Travertine floor. Clean Travertine Floor – What is a Travertine Floor? It is a mined from the Earth and is used mostly in commercial buildings and to a much lesser extent in residential locations. Travertine is basically marble but with the softer marble minerals eroded or washed out over time through water running through the stone while still in the Earth. Travertine is a beautiful looking stone with a natural interesting irregular pattern of holes and channels that become exposed when it is cut into tile or slabs for floors and walls. It is slightly harder than marble but not quite as hard as Granite. It is durable and stands up well to foot traffic. Wet Floor Signs or Barricade area being cleaned with Caution Tape. If entrance matting is removable, unload soil from entrance matting. If not, utilize a dry vacuum procedure to remove the loose soil from the matting. Dust mop floor with untreated dust mop to remove most of the surface dust. However, if microfiber dust mops are available, they are the recommended tool for this procedure. Remove gum and other debris adhered to the floor with a Blunt Plastic Scraper. Manual Cleaning: Damp mop entire floor using a mop and bucket method. Best practice would be if using a mop to use a quality microfiber flat mop system. A quality microfiber system will deliver high performance results with this cleaning procedure. Use professional grade Stone or Travertine Floor Cleaner according to label directions. Remove black marks and scuffs with light duty white pad or tennis ball. New Innovation: The “That’s Amazing” Cleaning Pad; a special laminated pad that fits on a doodlebug holder designed to manually scrubs deep into the pores of the floor and penetrates soils easily. Inspect floor after it has dried. Remove wet floor signs after the floor has been thoroughly dry. Power Equipment Cleaning: Mix a professional grade Travertine cleaner according to label directions and clear potable water in the automatic scrubber’s solution tank. Using the automatic scrubber equipped with red, white or the “That’s Amazing” Floor Cleaning Pad and clear potable water in the solution tank; make one single pass with the automatic scrubber, with floor pads down, solution valve half-open, squeegee down and vacuum on, pick-up the solution thoroughly. New Innovation: The “That’s Amazing” Cleaning Pad; a special laminated pad that fits automatic scrubs and single disc swing machines. They come in three sizes; 13”, 17” and 20”. When used with power floor machines, the “That’s Amazing” Floor Cleaning Pad scrubs deep into the pores of the floor and penetrates soils easily. It is recommended that commercial buildings use commercial grade Travertine and/or stone cleaners, tools and equipment. Best practices include the following.